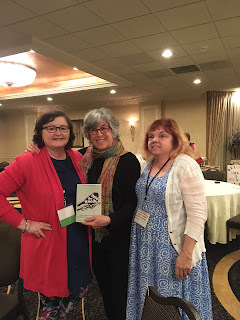 HALLIE EPHRON: I'm reporting in from Pennwriters 31st Annual Conference in scenic Lancaster, PA. I've been here since Thursday and I'm leaving tomorrow, and it's simply one of the most terrific writing conferences on the planet. One of the pleasures of blogging on Jungle Red is meeting far flung writers, and then you go to a distant conference and get to meet them in person! First day, first table I sat down at, there was Jim Collins. Here's Jim a few years ago at Malice (I think), taking one for the team for our Jungle Red Writers panel. And here he is this weekend at Pennwriters--Jim is working on his first novel, and we'll be thrilled when it comes time for him to talk about it as a guest on Jungle Red. 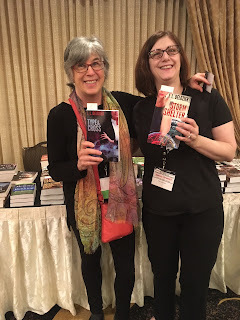 Here's the conference's amazing bookseller, Jilann Burnett of Second Chapter Books in Middleburg, VA.... where I will have to pay a visit, and not just for the bookstore. A well kept secret (up to now) is how many celebrities have second homes there. Shhh. Then there are all the talented writers you meet. That's Donna Galanti on the left (who's guested here on Jungle Red) with her second novel, THE HUMAN ELEMENT. And Kathryn Craft in the middle. Her novel is women's suspense (up my alley) set in the world of dance, THE ART OF FALLING. Gayle Lynds gave a brilliant keynote that earned a standing ovation. She started out by saying, "I'm Gayle Lynds, and I'm a writer." To thundrous applause. She talked about her new spy thriller, THE ASSASSINS, which sounds irresistible. She's giving a workshop today on plotting which I wouldn't miss for the world. And here's J. L. Delozier (I'm holding her book TYPE & CROSS which was a finalist for the Thriller Award for best first. And here's Ramona DeFelice Long and Kimberly Kurth Grey with their anthology of essays and poems and stories, INTO THE WOODS, by Mindful Writers Retreat authors. All of its proceeds will go to benefit the Children's Heart Foundation. It's going to be my train ride reading back to Boston on Sunday. Yay Amtrak! I know this has been a busy weekend for writers. Anyone reporting in from RT? Elsewhere? Has the sun come out? Alas, there’s been no sunshine here, but it does look as if you’re enjoying the conference. Thanks for all the wonderful pictures . . . .
A bit of sun here, but the royal wedding is enchanting me. Right now with a lively American preacher saying stuff in a way I bet has never been said in that staid church before! Say hi to Ramona and Kim for me. I'm reporting in from the royal wedding, where the sun is definitely shining. Continue enjoying the conference, Hallie. It sounds terrific! I've been up for two hours watching the royal wedding, and it was so worth getting up for. I love the American additions, from the Bishop whom Edith mentioned to the full heart-felt smiles that are wonderfully more pronounced than the stiffer British royal smiles. The conference looks like great fun. Enjoy! Missed the royal wedding but everyone here was late to breakfast and abuzz about it. Hallie, give everyone smooches from me —love pennwriters ! Your ears must have been burning, Hank - so many people are sending you fond regards from here. It figures. The one year I can't make Pennwriters is the year you're there. Oh well. Royal wedding here, too, envying their sunshine on this rainy, gloomy Cincinnati morning. Good luck to Jim on his first book! What fun! The best part of conferences is hearing about books that would have passed you by otherwise. I did my first public speaking gig since... I can't remember. Since Ross got sick, so well over a year and a half. It was at the Osher Lifelong Learning Institute in Portland. I was keynote speaker for their end-of-the-semester writers groups celebrations. I had the pleasure of listening to several of the participants read aloud from their (excellent) work. OLLI focuses on senior citizens - thus the "lie-long" part - and it was instructive to see such creative blossoming from people in that stage of life. Of course, I know from right here at JRW that 50+ seems to be the best age for writing, but in a world where the spotlight trains on "Best Writers Under 30" or "40 by 40," it's good to remember the power of wisdom and experience. Speaking of which... good luck with your novel, Jim! So funny you mention wisdom and experience. One of the presenters was suggesting we NOT go looking for fancy words in a Thesaurus and I tried to explain that's not what I use it for (and he will when he has a few more miles on him): to find the words I've forgotten or misplaced or for some reason fail to bring up when I need them. Royal wedding here, too but if I had the opportunity to see Hallie, I'd choose that instead. What a glorious day for a wedding and what a glorious setting. Next time I want to get married at Windsor , too. Hot and sunny in Houston. I’m watching the repeat of the wedding festivities right now on BBC America. Ooh! There’s George Clooney! Thank you for the wonderful photo and mention of our anthology, Hallie! We put a lot of love into it. It is great to see you here, and I am looking forward to your next session. We got up at 5:00 to see the wedding, but I forgot the mimosas!! Looks so fun, Hallie! I’m at RT in Reno - conferences are the best. You are surrounded by your people! No Royal Wedding here. Tuning in for the Preakness. OLLI has writing classes? Must check this out for USF. The photos are splendid, always nice to see the faces behind the words.. Jim keep on typin'. Thanks for the reminder. We’ve been watching the wedding all day. Hallie, what good things did you eat in Lancaster?